While I have nothing against injectables (I've gotten consultations and even made an appointment that I ultimately slept through and took as a sign), I have an almost paralyzing fear of needles. It's not so much the pain as it is the bizarre anxiety that takes over my body and causes fainting spells at the mere sight of a syringe. So I've decided to table the Botox and filler frenzy going on inside my brain for now and instead research a few other options. Below, find the most effective treatments if you're looking to stay away from the needle but still want a bit of lift and tuck. Similarly, if you've had fillers or Botox and want to extend the results, these offerings are your new best friends. New York–based plastic surgeon Norman Rowe, MD, created a facial that allows for a bespoke cocktail of Botox, dermal fillers, vitamins A and C, as well as a complex of anti-aging nutrients to penetrate the surface layer of your skin through micro-needling rather than injections. "Deeper injections of Botox and fillers address wrinkles and nasolabial folds, but they don't affect the appearance of the skin itself," Rowe told Harper's Bazaar. "I thought, 'Wouldn't it be great to use a micro-needling technique to get the Botox and other nutrients exactly where they are needed?'" This treatment delivers the liquid solution into the surface layer of the skin and is less invasive than traditional Botox or dermal filler treatments while providing similar results and long-lasting benefits (results tend to fade after the four-month mark, much like injections). The results include eliminating fine lines, tightening your skin's surface, resurfacing the top layer of skin, reducing pore size, and, of course, providing that undeniable glow. Let me start by saying I flew to Charlotte, North Carolina, just to get this facial treatment. It's where Toska Husted, a European-trained facialist with a loyal contingent of celebrity clients, lives and works out of her namesake spa. There, she performs a "remodeling" facial, which combines electric currents (to tone and sculpt facial muscles, improving muscle memory and revitalizing the epidermis) with French-girl favorite, Biologique Recherche skincare products. First, she uses Biologique Recherche P50 1970 ($65), the virtues of which you can read about here, and Biologique Recherche Soin Lissant to regenerate the skin. Husted combines a cocktail of other masks and serums, personalized to your skin type, and follows up with a facial massage worthy of all kinds of praise. Then, the "remodeling" begins. The machine uses three different types of electrical currents to allow for optimal penetration, sculpting, and an all-over glow. "These three currents can be used either separately or in combination, offering a wide range of personalized treatments for each skin type," Husted says. "Precise adjustment of these parameters is what enables the remodeling process to be activated in both the skin and the muscles." Husted massaged every nook and cranny of my face with microcurrent nodes, practically smoothing out each fine line in her path. My whole face vibrated, and I could almost feel my blood circulation kick up. She moved the machine across the contours of my face, slowly toning and sculpting until my jawline was more defined than ever before. "The longterm benefits are toned facial muscles, wider and rested looking eyes, more prominent cheekbones, reduced appearance of wrinkles, a more defined facial contour and firmer, and more youthful skin," she says. 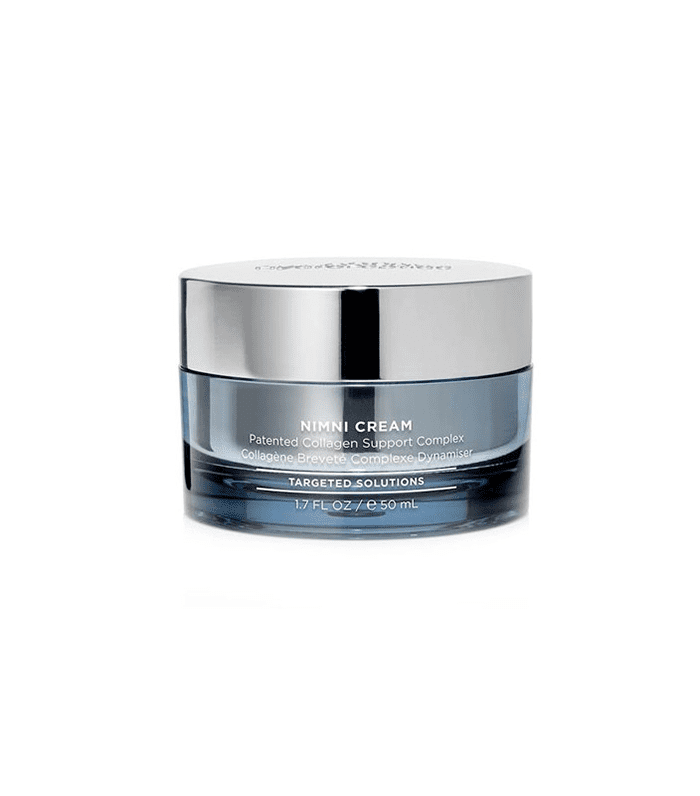 HydroPeptide combined Marcel Nimni's, PhD, research on collagen (he discovered Type II Collagen) with time-release retinol to create a moisturizer that actually lessens the look of fine lines and wrinkles. The formula activates your body’s own collagen-producing genes and feeds your skin cells the physical materials needed for collagen synthesis. Apply a small amount to clean skin at night, careful to avoid your eyes and the corners of your eyes. Start off using it twice a week and then increase your frequency as tolerated. After just a few weeks, you'll notice an improvement in your skin's fullness and elasticity. Next up: Use these three healing products for a facial gone wrong.